Today I passed by my old cousins apartment building. I used to hang out at his place every weekend during the 80's and I had many experiences there and all of them good. But, the building was old then, it looked like it was going to fall apart and it was really dirty. So today I was on my way trying to find the restaurant China Kitchen so I could have lunch when I happened to pass by my cousins place. I couldn't believe the building was still there, and not only that but it was occupied and looked worse then ever. 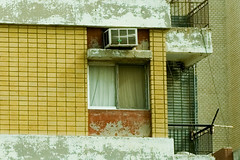 Back in the 80s the building was in bad condition, now its just a disaster waiting to happen. Its a depressing site but I had my camera with me and I took a couple of pictures of the building and surrounding area. My cousin moved to Canada before the Gulf War so I am sure he will enjoy the pictures I took. I am also sure it will bring him back good memories.